Prepare the pastry: In a small bowl, combine the egg yolk, cream, vanilla and almond extracts. In the work bowl of a food processor combine flours, powdered sugar and salt. Scatter the chilled butter over the top of the flour mixture and pulse until the mixture resembles coarse meal, about 20 1-second pulses. With the machine running add in the egg mixture. Process until the dough comes together into a ball. Turn the dough out onto a large sheet of plastic wrap. Wrap up the dough and shape into a 6-inch disk. Refrigerate until well-chilled, at least an hour or up to 48 hours ahead of time. After the dough is chilled. Remove from the refrigerator and place the dough between 2 sheets of plastic wrap or parchment paper and roll out into a 13-inch circle (or if your tart pan is only 9 inches, roll out into an 11-inch circle). Peel the top sheet of the plastic or parchment off the dough and carefully transfer to the tart pan, peel the second piece of plastic or parchment off the dough and fit the dough into the pan (if you are finding the dough too soft to work with, transfer the dough and pan into the freezer for a couple minutes and it should firm back up). Roll your rolling pin across the the top of the tart pan to trim the dough even with the edge of the pan, use the scraps to repair any tears, and/or reinforce any thin spots. 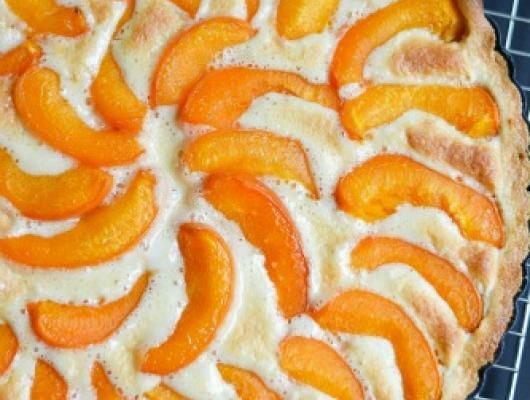 Place the tart shell in the refrigerator while preparing the filling. Preheat the oven to 400º f.
Make the filling: Combine ground almonds, butter, 1/3 c. sugar, and salt in a mixing bowl. Using an electric mixer beat until combined and fluffy. Add egg, vanilla and almond extracts, beat well until combined. Add the 1 T. flour, beat until combined. Remove the tart shell from the refrigerator and scrape the filling into the shell, spread evenly over the bottom. 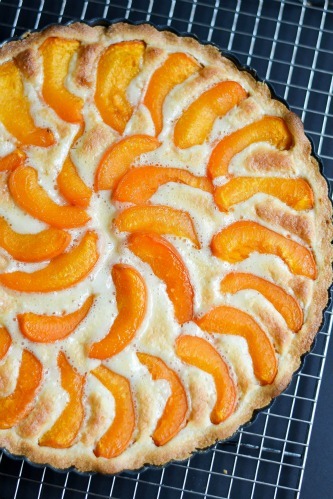 Arrange the apricots over the filling, pressing the fruit lightly into the filling. Sprinkle the top of the fruit with the remaining 2 t. sugar. Bake the tart 35-40 minutes, until the filling is set and puffed and golden around the edges. Cool completely before serving.